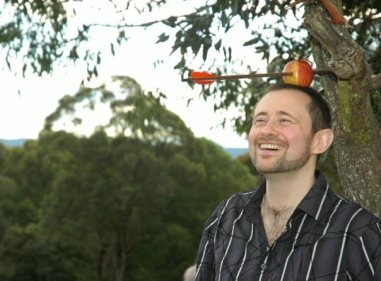 My name is Duncan Lay and I'm the author of the Australian best-selling fantasy trilogies, The Dragon Sword Histories and the Empire Of Bones. I am now with Momentum Books (Pan Macmillan) and my new series, The Last Quarrel is out in eBook and print. Book 2, The Bloody Quarrel, is coming out in December 2015/Jan 2016 in eBook and will be in print later in 2016. Head over to my website, www.duncanlay.com for more! I flew out of a beautifully sunny Sydney into a wild couple of days in Adelaide with some crazy weather! The flight down to Adelaide was probably the bumpiest one I've ever had ... you know it's getting bad when the hostesses stop serving food and make a run for their seats. Anyway, I landed fine and was met by HarperCollins' outstanding rep in Adelaide, Anthony Little. With him, I knew I wouldn't get thrown to the wolves! Adelaide is a sad story, bookstore-wise, having lost almost every store I visited last time. There are many major shopping centres without a bookstore at all. First up was the big CBD Dymocks and the weather was shocking. So bad that the planned Olympian Welcome Home parade had been cancelled! I couldn't get out into the mall but there were plenty of people around and I met some fantastic ones, including people who bought the entre first trilogy, plus Bridge Of Swords in the one hit. Things had been going well and I was a little reluctant to leave as we headed off to Dillons at Norwood, a big store in a nice suburb but out in the open. That started off well; I met a young African who turned out to be one of my biggest fans! Sadly he hadn't realised I was going to be there so hadn't brought any books to sign, so I gave him a signed poster instead. Then the bad weather hit. A huge hailstorm that cut the power to half the store and (not surprisingly) stopped anyone going out! That was a bit disappointing and certainly cut down on the number of people I could talk to - let alone the sales. Last one for the day was Mostly Books at Torrens Park, a small, community shopping centre with the kind of bookstore I love to support. We did very well there, although people were a bit scarce, with one of the highlights how the trolley guy Andrew ended up buying Bridge Of Swords for his father, after I gave him the spiel in about five different installments as he went past on his duties! Second day kicked off at my favourite Adelaide store, the outstanding Collins Edwardstown, with the extraordinary Tarran doing the promotional duties. Again, this went very well, although I was hindered somewhat by a bloke who obviously thought he was helping me by bagging out the people who ignored my greetings. Er, no, that's not helpful or very nice! When I ask someone if they like to read and they turn around and brag how much they hate reading and how the television is so much better, I feel sorry for them, that they haven't discovered the power of imagination, and I dearly hope their children do. Not that I'd say that but this chap decided to give them character references, which was putting everyone off! If I'd known what was coming next, I would have stayed at Edwardstown longer. Dymocks Glenelg was next cab off the rank and the weather decided to turn on me again. Earlier in the month, I'd done a breakfast signing at Dymocks North Sydney, where the wind chill effect had the temp hovering below 3C and few people wanted to stop and talk, for fear of frostbite. That seemed like a tropical paradise compared to the howling wind and rain coming down Glenelg's main street. I lost my sign twice and only strategic placement of books saved the tablecloth. My heart went out to those brave souls who stopped to chat and bought books off me but I felt gutted for the store, that I couldn't do more for them. Last store on the trip was Pages & More West Lakes, inside a shopping centre, where I was able to thaw out and sell a stack of Bridge Of Swords - then finish with a copy of Wounded Guardian as I was walking out the door. So that was Adelaide, a beautiful town with horrible weather for those two days - and some great bookstores that I sincerely hope I could help a little. In the immortal words of The Terminator: "I'll be back". Best-selling Australian fantasy author. My first two trilogies, The Dragon Sword Histories and the Empire Of Bones, were published by HarperCollins (Voyager). My new series is published by Momentum Books (Pan Macmillan) and will be available worldwide as an eBook ... If you want to know more, look for me on Facebook or Twitter or check out my new website. Hot and cold in Canberra!